Sync subscribers' emails with your MailChimp lists in the blink of an eye! Syncing subscribers' emails with your MailChimp lists is really easy with our WP Ultimo: MailChimp Integration Add-on. This tutorial aims to help you get everything set-up! Before we start to get into the different settings available, we need a MailChimp API key. This will allow WP Ultimo to talk with the MailChimp API to retrieve lists, groups, and add email addresses to those lists and groups when users sign-up. The MailChimp Integration add-on offers two “integration modes”, which means there are two different ways you can use the add-on to sync email addresses. Two integration modes for greater flexibility! The default mode makes use of Multiple Lists. This mode will allow you to select multiple MailChimp lists for each of the plan. This is the best option if you segment your users in different lists. For example, let’s suppose you have 3 different lists on your MailChimp account: Newsletter, Plan A, and Plan B. You want all users, regardless of their plan, to also be included on the Newsletter list, so they won’t miss your updates. To achieve that, you can use the Multiple Lists mode to add both lists Newsletter and Plan A to the Plan A MailChimp Settings, and Newsletter and Plan B to the Plan B MailChimp Settings. 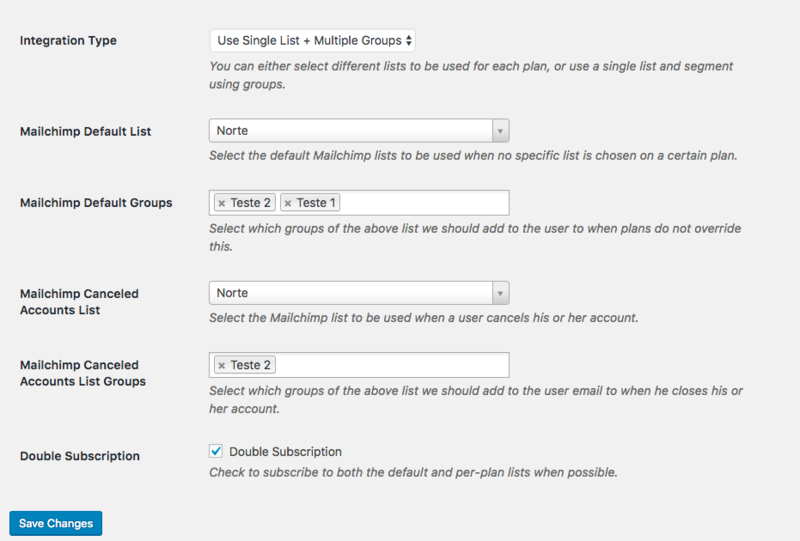 MailChimp allows you to segment your list into smaller groups of users called Groups. This allows you to have more control as you can send campaign to a specific sub-set of your subscribers without having to create multiple copies of the same campaign on MailChimp (which makes it hard to analyze the metrics of that campaign afterwards). For example, you can have a single list called My Network Subscribers and inside it have groups for Plan A and Plan B. After you selected which integration mode makes more sense to your particular use case, it is time to select the default lists (and groups, depending on the mode). The default list will be used when a given plan does not have a specific List selected. You can also select the default list for canceled accounts. Whenever a user terminates his or her subscription and removes his or her account from your network, his or her email address will be moved to the list set for canceled accounts. On the same settings page you’ll be able to enable Double Subscription. This option will add the user to both the default list selected AND the list selected to that user’s plan. If this option is not enabled, the user will only be added to the list selected for the user’s plan. If none is set for that particular plan, then the user will be added to the default list selected. Go to your Plans and select the plan you want to edit. Note that on the Advanced Options meta-box, a new tab called MailChimp will be available. On that tab you’ll be able to select multiple lists or a single list and multiple groups (depending on the integration mode) for that plan. When a new user sign-up to that plan, his email address will be added to the selected lists and groups!